Demonworld Miniatures – FASA Games, Inc. 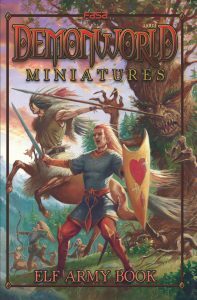 The Demonworld: Miniatures game takes place forty years before the RPG setting and serves as a sort of prelude to current events. The Dark Elves have not yet returned to Tinére. The Enotmids are yet unknown to the northern races. The races fight each other in unending wars that tear apart the lands and soak the earth in blood. Currently, there are three books available. The Miniatures Corebook, Dwarf Army book and Thain Army book are all available in our online store. The Corebook contains everything you need to know to start a game of Demonworld: Minatures. From basic rules introductions to pre-built scenarios, the Corebook is the beginner’s handbook. It also includes several stat blocks for Dwarven and Thain units so you can get started right away, as well as background information on both armies. The Dwarves are masters of technological innovation, and their armies take full advantage of their strengths in the field. They carry firearms, pilot impressive machines of war, and have some of the deadliest cannons and mortar devices in Tinére. In battle, Dwarves are known for their strict discipline and complex tactical maneuvers. Riflemen and bombardiers cover the advancing infantry and make way for the 10-foot-tall battle suits that are capable of both crushing opponents underfoot and blowing them to smithereens. The Dwarf Army book contains stat blocks for all Dwarven units, as well as detailed information on the Dwarven race in the Demonworld setting and how they fit into the world. The Thain are a society of humans that live apart from the mainland. They revere and worship nature, animals, and the spirits, but they are no strangers to war. Thain warriors are tall and strong, and the worthy are privileged with commanding the gigantic beasts that are native to the Thayan islands. The massive creatures are capable of carrying a dozen troops in their back and crushing a dozen more under their hooves. 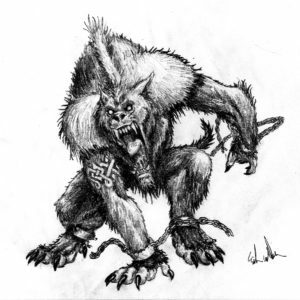 The Thains’ close relationship with nature has also blessed some of the Thain warriors with the power to change their shape into that of their chosen animal totem. Men can change into huge bears, boars, wolves, and eagles at will and tear an enemy apart with the weapons of nature’s own army. Thain society is led by shaman and elders. They rely on the wisdom of age to guide them to righteous victory in battle. The Thain Army book details Thain units, has history and background information on the Thayan people, and instructions on how to build your own units, in case you think of something great that we haven’t. It has been twenty years since the demons returned. The Elves of Iconessa have been wandering the lands of the Humans and Dwarves without a home to call their own. Once proud and mighty, the Ilah Ri and Thanaril have been forcibly humbled, but not brought low just yet. They are slowly gathering their resources and devising a plan to take back the forest that was once theirs. It may take decades to drive out the filth of the demons, but they have many centuries of life to give to the cause. The elven forces command archers of unmatched ability, spellcasters that call upon the forces of nature, and creatures that fight to reclaim their forest homes at all costs. This 3rd edition of the Elves introduces Pixies, NEW Centaur units, and the new-found Dragonfly riders. In the next year, we hope to bring you the Isthak and Orc army books.